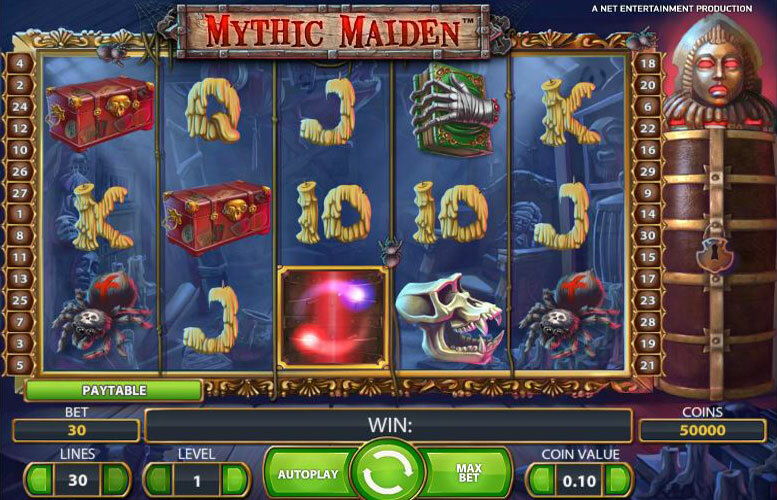 The Mythic Maiden slot machine has a monstrous 600,000 coin top jackpot and you can bank it for yourself in just one spin of the reels. The theme might be scary but there’s nothing scary about the payouts which just get bigger and bigger with free spins and a 10x multiplier available! 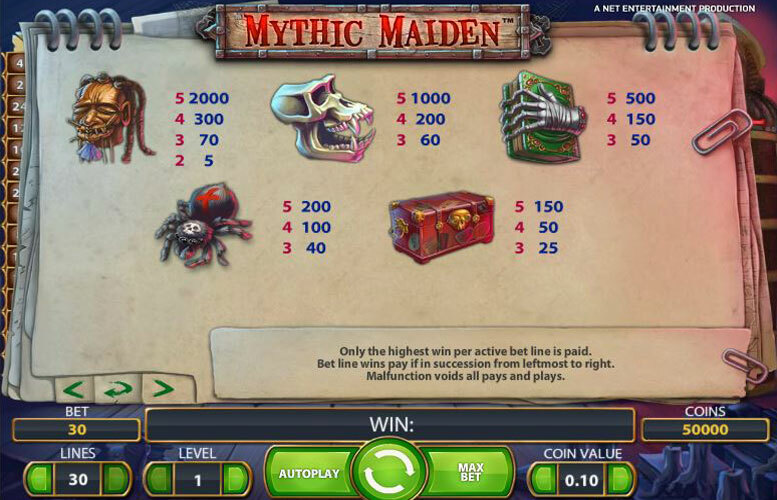 If you like spooky and eerie then you are going to love the Mythic Maiden 5 reel 30 payline slot. There is no continuous soundtrack, but lots of spine tingling sounds to make your blood curdle each time you spin and the slot has good graphics with the platform being NetEntertainment, so you know it’s going to be quality. There is not a lot of animation until you win the free spin feature. Then the Iron Maiden you see on the right side of your game screen will open up to reveal your multiplier. You are going to have fun with the Skill stop feature and the free spins bonus. The scatter and wild multipliers will give you some extra chances to win as well. There are great icons which are applicable to the scary theme and even though it has the usual boring face card symbols they are nicely done and fit in well with the spooky theme. To win the jackpot of 600,000 coins you will need to collect 5 in a row of the Shrunken head across all 30 paylines. It’s no mean feat but it’s some payout if you manage to spin it in! If you only get 4 of these you will receive 300 coins and for 3 you will get 70, while 2 will give you a mere 5… so it’s a bit of a case of all or nothing. The Maiden Spirits symbol is that strange glowing symbol that looks like a red pole with colored balls floating around it. This is the scatter, which means if three or more of them appear anywhere in your spin then you are awarded the free games feature. You have the chance to win up to 30 free spins and a 10x multiplier. 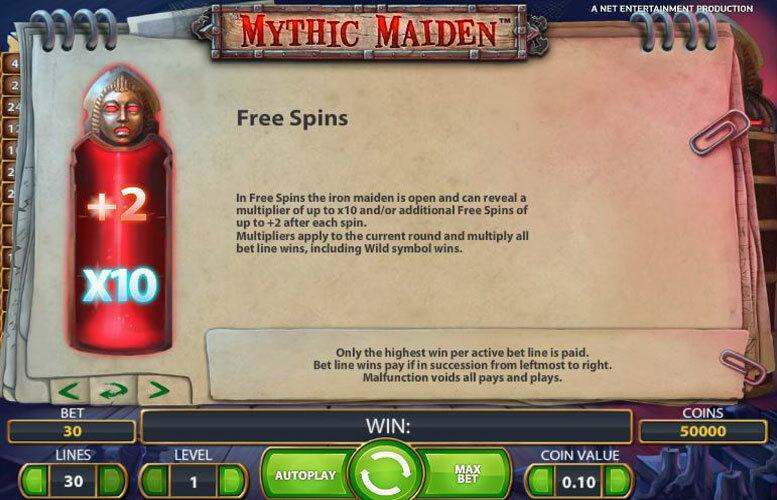 As soon as this feature is activated, you will see the Iron Maiden on your right open up to reveal the multipliers that can be awarded during your free spins when you land winning combinations. The value of this multiplier can be up to 10x and may also award additional free spins as well. Or sometimes it will be generous and give both the multiplier and some free spins. The extra free spins won along with the multiplier in the free spin segment, can be either one or two more. 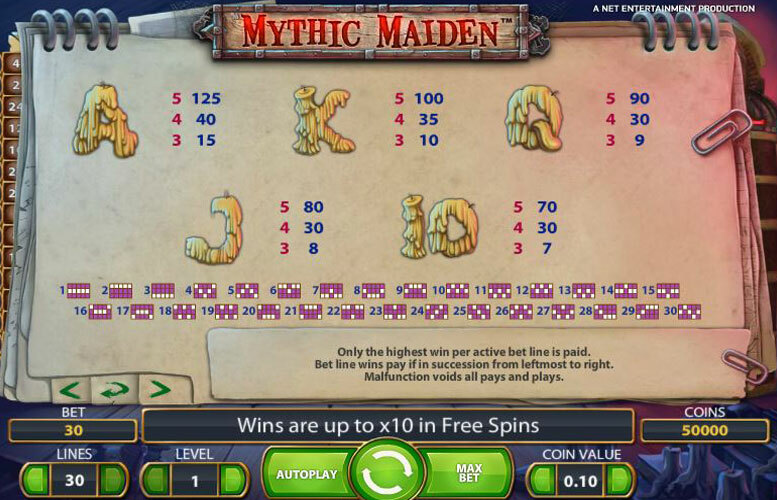 If you happen to land 3 or more of the Maiden Spirits while you are in the free game mode then you can win an additional 10, 15 or 30 free spins. The moon with the skull in the center of it is the wild multiplier. It will act as a replacement and multiplier for any of the other symbols when needed to complete a winning combination. 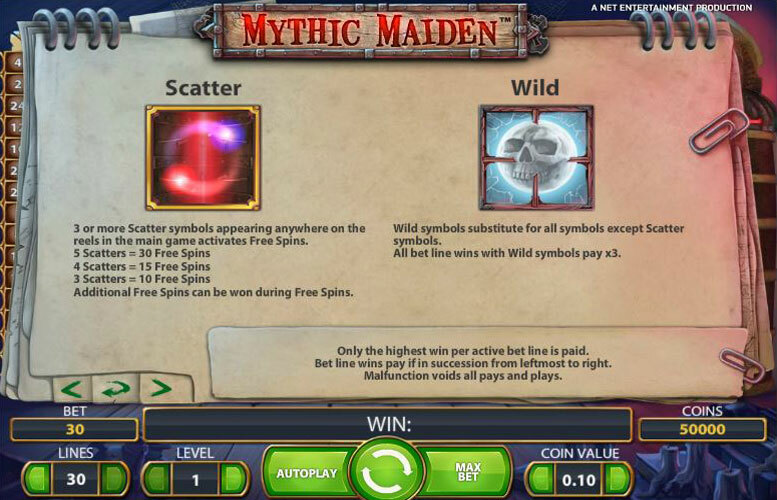 It will not replace the Maiden Spirits symbol nor will it activate the Maiden Spirits free spin game. If you feel that your luck isn’t that great and you want to maybe try and change it, you can always try the skill stop feature. This is where you hit the spin button while the reels are spinning and it stops them immediately. Some people are superstitious and think that by changing their method of play it changes their luck. Something else you may want to try is the auto play. Here you can set the slots to spin automatically for a number of spins. The gorilla skull is going to pay you 1,000 for 5, 200 for 4 and 60 for 3. The book of shadows will pay 500 for 5, 150 for 4 and 50 for 3. The tarantula spider will pay 200 for 5, 100 for 4 and 40 for 3. The chest of secrets will pay out 150 for 5, 50 for 4 and 25 for 3. The ace will pay out 100 for 5, 40 for 4 and 15 for 3. The king will allot you 100 for 5, 35 for 4 and 10 for 3. The queen will pay 90 for 5, 30 for 4 and 9 for 3. The jack will give you 80 for 5, 30 for 4 and 8 for 3. The ten will pay out 70 for 5, 30 for 4 and 7 for 3. You can bet as little as 0.01 and only play one line or you can play up to 0.50 per line with a max of 10 coins per line set by the bet level. At maximum coin level (0.50) and maximum bet level (10) you’ll be playing for 300 coins per spin which in UK pounds would be £150. Obviously you can turn down the bet levels, number of paylines and coin value to suit your preferred stake amount. This game has a rating of 4 / 5 with 269 total reviews by the users.